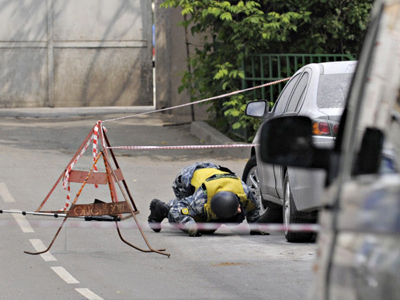 Investigators have found several hairs in the car used by the suspected murderers of Yury Budanov, a disgraced former Russian Colonel convicted of kidnapping and killing a Chechen girl. They also say Friday’s crime was carefully plotted. ­On Saturday, people – most of them nationalists – have been taking flowers and lighting candles at the site of his death. The police had to intervene preventing a spontaneous demonstration when a man started shouting “The Russians are being killed!” The man was taken away from the street to the anger of some of those there. Budanov, who led a secluded life after his early parole in 2008, was said to be aware of being traced, as his army friend told Life News newspaper on terms of anonymity. Budanov told his friend he would not be going into hiding, as he was sure to be found anyway. Nevertheless, the former colonel asked the Ministry of Interior to provide him with security – an appeal which was denied by the Ministry several times since Budanov left prison. “Nobody would grant him security. 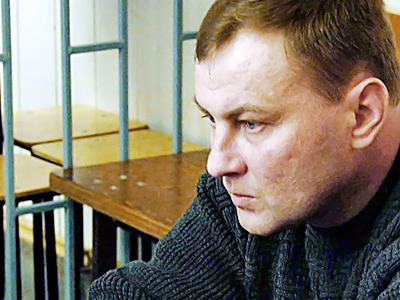 This country has no practice to protect former prisoners,” said Aleksey Dulimov, the lawyer who defended Budanov, when the ex-Colonel was tried for the Chechen girl Elsa Kungayeva's abduction and murder. Budanov’s killers, who left the crime scene on a white Mitsubishi Lancer, abandoned the car in a nearby area and set it on fire. The police failed to find any fingerprints in or on the vehicle, but picked up some hairs. They hope the hairs belong to the suspects and can be used to identify them. No trace of fuel was found outside the car, which could mean that the auto had been soaked with petrol prior to the crime. The police continue their searches of the two suspects using footage from street CCTV cameras and the facial composite drawn up on witnesses’ evidence on Friday.